Want to enjoy videos or audio songs in your Android devices at anytime and anywhere without Internet connection worries? 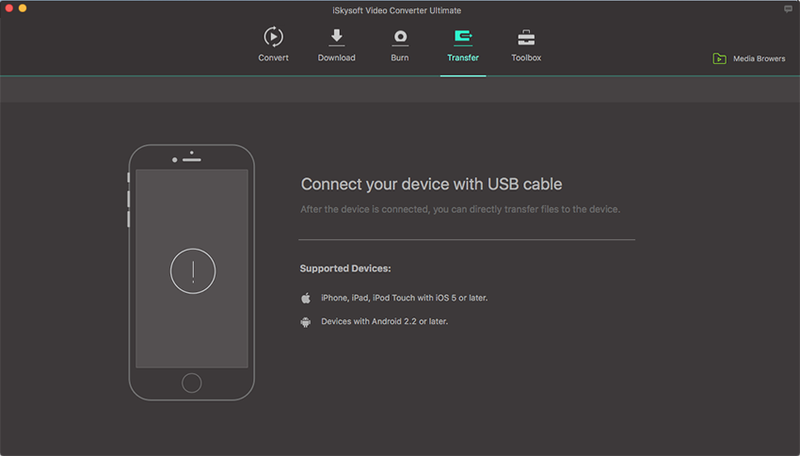 iSkysoft Video Converter Ultimate could do you a favor with its easy-to-use transfer feature! 1.Sync your Android device with your Mac. Open iSkysoft Video Converter Ultimate and click the transfer button on the top of the main interface. Once connected to your Android devices with USB cable, you need to follow the prompts of the program to enable USB debugging on your device. Please note that enabling USB debugging may vary with Android model and OS, it would be better that you follow the corresponding prompts to your device. 2.Select media files to be transferred. After connecting your Android device, click "Add Files" button in the Transfer tab to import video or audio files to be transferred. Or you can directly add audio or video files to transfer list from Converted or Finished list in Convert and Download tab separately by clicking "Add to Transfer" button on the right of each file clip. A third way is to right click on your target file and select "Add to Transfer List". 3.Start to transfer videos to your Android devices.